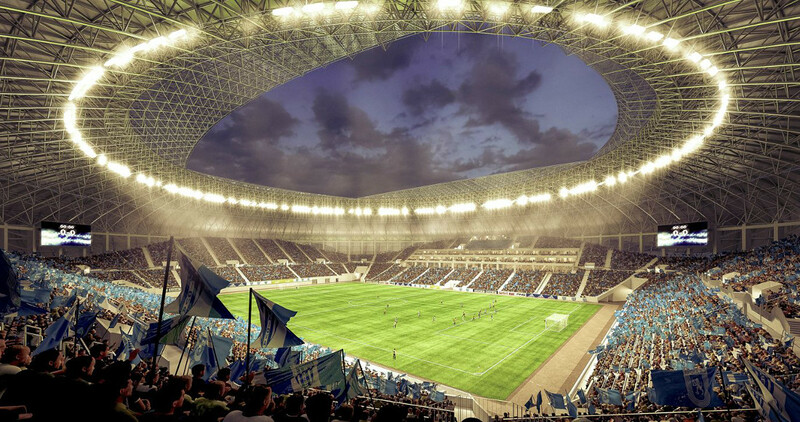 Noul Stadion Ion Oblemenco is the recently opened new stadium of Universitatea Craiova. The stadium got built in place of the old Ion Oblemenco, which was an open bowl with athletics track and didn’t meet the standards of modern time. The new stadium would initially have a capacity of 40,000, which was later scaled back to a little over 30,000. Demolition of the old stadium started in early 2015, and construction of the new one started in the summer of the same year. The new stadium was initially scheduled to open in December 2016, but delays first pushed this back to early 2017 and then to late 2017. Noul Stadion Ion Oblemenco officially opened on 10 November 2017 with a friendly between Universitatea Craiova and Slavia Prague (0-4). The stadium came at a cost of €50 million. Noul Stadion Ion Oblemenco is located just south-west of Craiova’s city centre, just a 5 to 10-minute’s walk away from the centre. Craiova’s railway station lies further north-east, about 3 kilometres away from the stadium, but various buses connect the stadium with the centre, from where it is a small walk. Universitatea Craiova tickets can be bought online, or at the ticket office at the stadium. Expect to pay from RON 10.00 for a seat behind the goal to RON 25.00 for a seat at the main stand. Prices are increased to between RON 15.00 and RON 40.00 for a number of high-profile matches. Ucv1948.ro – Official website of Universitatea Craiova.